Innovation is the key to success in the 21st century. Innovation is about doing new things, doing things in a new way or creating the platform for others to bring new ideas to fruition. 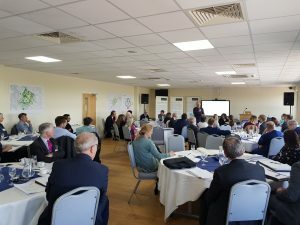 We usually think of innovation in relation to goods and services, but earlier this month a diverse group of committed people came together in Colchester to consider the role of innovation in place-making for North Essex Garden Communities (NEGC). Discussion often started from the potential of new technologies and the need to adapt to their impact on work, leisure, transport, energy and building design. However, we usually ended up discussing the need for a new, business model and new forms of governance as the key to unlocking innovation. So what could be the characteristics of pro-innovation business model? – Firstly, it needs to be built around a long-term, 30-50 year vision. For example, this means thinking about the total life cycle of buildings and infrastructure and requires patient finance that can afford to wait for a return? – Second, it means taking a whole systems perspective, what some people called ‘total place.’ This means thinking about all the interactions between all the “silos” of work, enterprise, health, education and learning, leisure, transport, energy. – Third, it needs to be flexible and adaptable to the kinds of changes and challenges that will arise over the next 30-50 years. This could mean designing for change and empowering the inhabitants to shape the community, rather than trying to provide a total ‘solution’ from day one. – Fourth, it means opening up the development process to a wider range of interests. This could mean encouraging small businesses, individual architects and even self-build, within a coherent master plan. – Finally, it means developing more appetite for risk than either the public or private sector traditionally favour. This could mean creating space for experiments and demonstration projects to put new ideas in practice and learning how to learn from and cope with the inevitable partial successes and outright failures. Many of these innovation imperatives pull in different directions, and might challenge other legitimate objectives, such as efficiency or economy, even if they serve the goal of effectiveness in the long term. The key challenge, then, is to create a system of governance for NEGC that is strong enough to hold all these forces in check and to insist on the importance of doing new things and doing old things in new ways.